Apart from our local CNC machinists turning up the hex nuts, these are produced in-house. 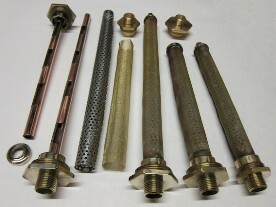 Fine woven brass cloth, correct pattern perforated tubing and thick wall 16 gauge copper piping are used. The whole part is then neatly soldered together. Please note that for customers using our deep capacity L/K sumps, we use the longer N Type strainer. The thickness of the hex head has been increased up from 3/16th inch after research. The Vintage MG Parts ring spanner for J Types and the larger F/L/K/P/N Types is snug fitting. 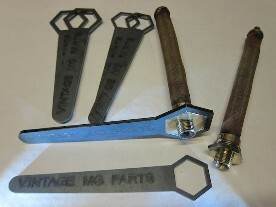 The ring spanner is offered as a free gift with all sump strainer products or can be purchased separately. Please remember to quote your model as there are two sizes. We also supply P Type engine sumps, N Type engine sumps and L and K Type engine sumps.